Shielding of an electric power cable is accomplished by surrounding the assembly or insulation with a grounded, conducting medium. This confines the dielectric field to the inside of this shield. Obtain symmetrical radial stress distribution withh the insulation. Eliminate tangential and longitudinal stresses on the surface of the insulation. Exclude from the dielectric field those materials such as braids, tapes, and fillers that are not intended as insulation. Protect the cables from induced or direct aver-voltages. Shields do this by making the surge impedance uniform along the length of the cable and by helping to attenuate surge potentials. In cables rated over 2,000 volts, a conductor shield is required by indusby standards. The purpose of the semiconducting, also called screening, material over the conductor is to provide a smooth cylinder rather than the relatively rough surface of a stranded conductor in order to reduce the stress concentration at the interface with the insulation. Conductor shielding has been used for cables with both laminar and extruded insulations. The materials used are either semiconducting materials or ones that have a high dielectric constant and are known as stress control materials. Both serve the same function of stress reduction. Conductor shields for paper insulated cables are either carbon black tapes or metallized paper tapes. The conductor shieldmg materials were originally made of semiconducting tapes that were helically wrapped over the conductor. Present standards still permit such a tape over the conductor. This is done, especially on large conductors, in order to hold the strands together firmly during the application of the extruded semiconducting material that is now required for medium voltage cables. Experience with cables that only had a semiconductingtape was not satisfactory, so the industry changed their requirements to call for an extruded layer over the conductor. In extruded cables, this layer is now extruded directly over the conductor and is bonded to the insulation layer that is applied over this stress relief layer. It is extremely important that there be no voids or extraneous material between those two layers. Presentday extruded layers are not only clean (free from undesirable impurities) but are very smooth and round. This has greatly reduced the formation of water tress that could originate from irregular surfaces. By extruding the two layers at the same time, the conductor shield and the insulation are cured at the same time. This provides the inseparable bond that minimizes the chances of the formation of a void at the critical interface. For compatibility reasons, the extruded shielding layer is usually made from the same or a similar polymer as the insulation. Special carbon black is used to make the layer over the conductor semiconducting to provide the necessary conductivity. Industry standards require that the conductor semiconducting material have a maximum resistivity of 1,000 meter-ohms. Those standards also require that this material pass a long-time stability test for resistivity at the emergency operating temperature level to insure that the layer remains conductive and hence provides a long cable life. A water-impervious material can be incorporated as part of the conductor shield to prevent radial moisture transmission. This layer consists of a thin layer of aluminum or lead sandwiched between semiconducting material. A similar laminate may be used for an insulation shield for the same reason. There is no definitive standard that describes the class of extrudable shielding materials known as “super smooth, super clean”. It is not usually practical to use a manufacturer’strade name or product number to describeany material. The term “super smooth, super clean” is the only way at this writing to describe a class of material that provides a higher quality cable thanan earlier version. This is only an academic issue since the older type of materials are no longer used for medium voltage cable construction by known suppliers. The point is that these newer materials have tremendously improved cable performance in laboratory evaluations. Metallic layer of tape or tap , drain wires, concentric neutral wires, or a metal tube. The polymer layer used with exbuded cables has replaced the tapes shields that were used many years ago. This extruded layer is called the extruded insulation shield or screen. Its properties and compatibility requirements are similar to the conductor shield previously described except that standards require that the volume resistivity of thisexternal layer be limited to 500 meter-ohms. The nonmetallic layer is directly Over the insulation and the voltage stress at that interface is lower than at the conductor shield interface.. 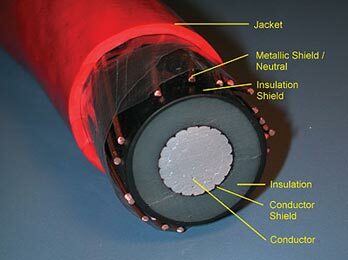 This outer layer is not required to be bonded for cables rated up to 35 kV. At voltages above that, it is strongly recommendedt that this layer be bonded to the insulation . Since most users want this layer to be easily removable, the Association of Edison Illuminating Companies (AEIC) has established strip tension limits. Presently these limits are that a 1/2 inch wide strip cut parallel to the conductor peel offwith a minimum of 6 pounds and a minimum of 24 pounds of force that is at a 90º angle to the insulation surface. The metallic portion of the insulation shield or screen is necessary to provide a low resistance path for charging current to flow to ground. It is important to realize that the extruded shield materials will not survive a sustained current flow of more than a few milliamperes. These materials are capable of handing the small amounts of charging current, but cannot tolerate unbalanced or fault currents. The metallic component of the insulation shield system must be able to accommodate these higher currents. On the other hand, an excessive amount of metal in the shield of a single-conductor cable is costly in two ways. First, additional metal over the amount that is actually required increases the initial cost of the cable. Secondly, the greater the metal component of the insulation shield, the higher the shield losses that result h m the flow of current in the central conductor. A sufficient amount of metal must be provided in the cable design to ensure that the cable will activate the back-up protection in the event of any cable fault over the life of that cable. There is also the concern for shield losses. The type of circuitinterruptingequipmentto be analyzed.What is the design and operational setting of the hse, recloser, or circuit breaker? What fault current will the cable encounter over its life? What shield losses can be tolerated? How many times is the shield to be grounded? Will there be shield breaks to prevent circulating currents? When concentric neutral cables are specified, the concentric neutrals must be manufactured in accordance with ICEA standards. These wires must meet ASTM B3 for uncoated wires or B33 for coated wires. These wires are applied directly over the nonmetallic insulation shield with a lay of not less than six or more than ten times the diameter over the concentric wires. Shielding of low voltage cables is generally required where inductive interference can be a problem. In numerous communication, instrumentation, and control cable applications, small electrical signals may be transmitted on the cable conductor and amplified at the receiving end. Unwanted signals (noise) due to inductive interference can beaslargeasthedesiredsignal. This can result in false signals or audible noise that can effect voice communications. Across the entire frequency spectrum, it is necessary to separate disturbances into electric field ef€ects and magnetic field effects. Electric field effects are those which are a function of the capacitive coupling or mutual capacitance between the circuits. Shielding can be effected by a continuous metal shield to isolate the disturbed circuit fiom the disturbing circuit. Even semiconducting extrusions or tapes supplemented by a grounded dmin wirecan serve some shielding function for electric field effects. Magnetic field effects are the result of a magnetic field coupling between circuits. This is a bit more complex thanfor electrical effects. At relatively low frequencies, the energy emitted from the source is treated as radiation. This increases with the square of the frequency. This electromagnetic radiation can cause dislxrbancesat considerable distance and will penetrate any “openings” in the shielding. This can occur with braid shields or tapes that are not overlapped. The type of metal used in the shield also can effect the amount of disturbance. Any metallic shield material, as opposed to magnetic metals, will provide some shield due to the eddy currents that are set up in the metallic shield by the impinging field. These eddy currents tend to neutralize the disturbing field. Non-metallic, semiconducting shielding is not effective for magnetic effects. In general, the most effective shielding is a complete steel conduit, but thisis not always practical. Test circuits to measwe the effectiveness of various shielding designs against electrical field effects and magnetic field effects have been reported by Gooding and Slade. Add sensing and telecom capabilities by embedding a fiber in metal tube within the metallic shield layer.